Setting a Mission Statement to Music Maybe it's an indication that the initial weirdness of listening to it has worn off, but pianist Jason Moran's scrupulous practice of using pre-recorded dialogue as a guide for etching melodic statements has never sounded as moving as it does on "Artists Ought to Be Writing." 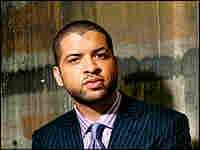 Song: "Artists Ought to Be Writing"
Maybe it's an indication that the initial weirdness of listening to it has worn off, but pianist Jason Moran's scrupulous practice of using pre-recorded dialogue as a guide for etching melodic statements has never sounded as moving as it does on "Artists Ought to Be Writing." When Moran first demonstrated this approach on 2003's The Bandwagon, the results were jarring and didactic. Again there's an edifying tenor to "Artists Ought to Be Writing," as sampled orator (and performance artist) Adrian Piper uncorks a manifesto urging artists to demystify the esoteric by letting people in on the inspirations, intentions and machinations of their works in hopes of building a more informed audience. The composition, nevertheless, rewards the listener with emotional magnetism via Moran's elegiac piano work. At first, Moran underscores Piper's androgynous voice with lovely chords; then, he slowly unveils melodic phrases that shadow-dance alongside her rhythmic cadence. Soon, it's easy to discover the inherent musicality of Piper's speech patterns — and, conversely, the soulfulness in Moran's analytical experimentation. As the sampled voice disappears, Moran continues to build upon Piper's recitation, unraveling a surging and sanguine improvisation.